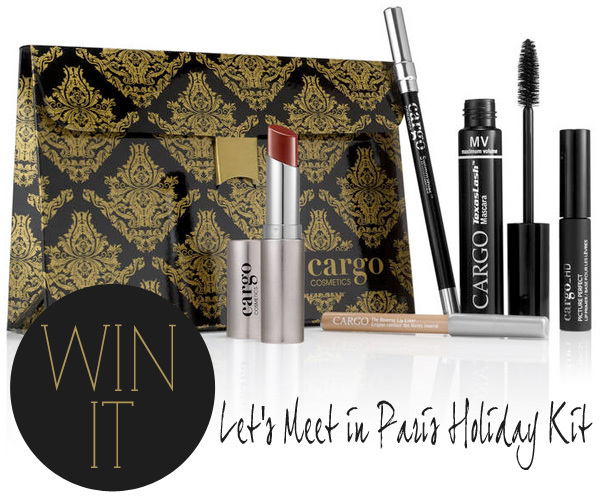 Win It: CARGO Let’s Meet in Paris Holiday Kit. Exciting news! One of my favorite makeup brands Cargo Cosmetics has just relaunched their website with a super chic new design. It's not only easy to navigate, I've been discovering and learning all about some great new products at the same time. Check it out at cargocosmetics.com. To celebrate the new launch, Cargo wants me to give one of YOU a special preview of one of their exclusive holiday sets before it hits stores. One lucky reader will win Cargo's Let's Meet in Paris Holiday Kit. Inspired by a luxurious trip to the French city, this kit evokes a sophisticated, fashion-forward feel with rich red and black tones with hints of sparkle. The look is 100% luxe - a bold red lip, soft eye with shimmery black liner and seductive full and defined lashes. Housed in a baroque patterned clutch-shaped carton, it makes for a festive gift or a splurge for yourself. The Let's Meet in Paris Holiday Kit won't even be available until November where it will be exclusively for sale at Ulta for $36.00 (an $85 value). To enter, leave a comment on this post telling me you want to win. Please read all of the sweepstakes rules below. By entering this sweepstakes, you agree to all official rules. US only. The CARGO Holiday Kit (the “Sweepstakes”) is intended for participation only in the United States (excluding Rhode Island) and shall be construed according to, and governed exclusively by, United States law. Do not participate in the Sweepstakes if you are not a legal resident of the United States (excluding Rhode Island) physically located in the United States (other than in Rhode Island) at the time of entry or do not fall within the eligibility requirements set forth in these official rules. NO PURCHASE NECESSARY. A PURCHASE, DONATION OR PAYMENT OF ANY KIND WILL NOT INCREASE CHANCES OF WINNING. ELIGIBILITY: Only legal residents of the fifty (50) United States and the District of Columbia (excluding Rhode Island) who are eighteen (18) years of age or older and located in the United States and the District of Columbia (excluding Rhode Island) at the time of entry are eligible to enter the Sweepstakes. Employees of Sponsor and Sponsor’s advertiser partners and their respective parents, subsidiaries, affiliates, distributors, retailers, sales representatives, advertising and promotion agencies and each of their respective officers, directors and employees (and immediate family members and those persons living in the same household of any such officers, directors and employees) (collectively, the “Promotion Entities”), are ineligible to enter the Sweepstakes or win the prize. Subject to all applicable federal, state and local laws and regulations. Void in Rhode Island, Puerto Rico, all U.S. territories and possessions and overseas military installations, and where prohibited. TO ENTER: "Post a Comment" on this post telling me you want to win. Each comment is assigned a number and five winning numbers will be randomly selected by random.org on or about November 4, 2013. Winner will be notified by email left by entrant in the comment form. Winner has 48 hours to respond or prize will be forfeited. All decisions by the sponsor are final. PRIZE DELIVERY: Sweepstakes prize will be fulfilled by prize sponsor within 6 weeks of sweepstakes promotion period ending. By entering this sweepstakes, you agree to all official rules.